Aleppo (pronounced ə-leʹpō in the revised ISBE). A single word. What does it mean to you? An ancient city of Syria. The largest city of Syria prior to the recent war. A place of warfare. A place of untold suffering and killing. A humanitarian crisis. A symbol of failure for numerous governments and world bodies. Or, a place you are pleased to have visited in better days? In 2002, a year after I retired from teaching, I asked one of my former colleagues at Florida College to join me for three weeks traveling in Lebanon, Syria, and Jordan, a trip I labeled LeSyJo for my files. David McClister agreed to do that. I had been to most of the sites that we wished to visit several times before beginning in 1967, and I had crossed the Anti-Lebanon mountains to visit Damascus a few times. But this time we wanted to see several major historical sites in Syria. Our itinerary in Syria included Damascus, Hama (Hamath), Homs, Riblah, Latakia, Ras Shamra (Ugarit), Qarqar, Ebla, Aleppo, and an excursion to the Euphrates River NE of Aleppo. South of Damascus we traveled the road “from Damascus” past Mount Hermon as close to the border with Israel as possible. On the way to Jordan we stopped by Bosra for a visit. We wanted to visit Palmyra, Mari, and a few other places, but our schedule did not permit it. David and I both had reasonably nice 35mm cameras, but I was carrying a Casio QV3000EX 4 million megapixel camera. What else could anyone want? Unfortunately these original images are only 1024 x 768 pixels. They do fairly well for a visual presentation, but very disappointing if one wants to use them in a publication. As technology has improved cameras we could wish to return and make new, more, and better photos. I think that not many readers will have had the opportunity to travel to Aleppo, so I will share a few photos from the Aleppo National Museum. Aleppo is not mentioned by name in the Bible, but it was likely visited by Abraham (Genesis 12:4), Jacob (Genesis 25:20ff. ; 35:22-27), and other Old Testament characters who traveled from Paddan-aram to the land of Canaan. Aleppo, once named Halab, was famous as “a sacred city of the weather/storm god—Teshub or Tarhuns to Hurrians or Hittites, Hadad or Baal to the Aramaens” (K. A. Kitchen, New International Dictionary of Biblical Archaeology). Alalakh was a major satellite-city of Aleppo in the second millennium, according to Kitchen. Rasmussen places Aleppo on a major international highway. Also visited Ebla and came to Aleppo. Hotel is a 4-star, not 5-star as last night. [These would not be by American standards.] Last night [in Latakia] we were in a new floor of the hotel overlooking [the Mediterranean]. This hotel is in center of city. Aleppo reminds me more of Turkey than Damascus does. Hotel personnel are helpful and friendly. I am not able to go to AOL, or Excite to get mail. A backroom manager type allowed me to use the hotel email to write. Our hotel was the Amir Palace. Two men went with us to our room. I recall it as being rather small — not a place one would wish to spend a lot of time. The men showed us how to turn on the TV. There was not much in English, but one of the men pointed out, with a smile, that we could watch news on Al Jazeera. 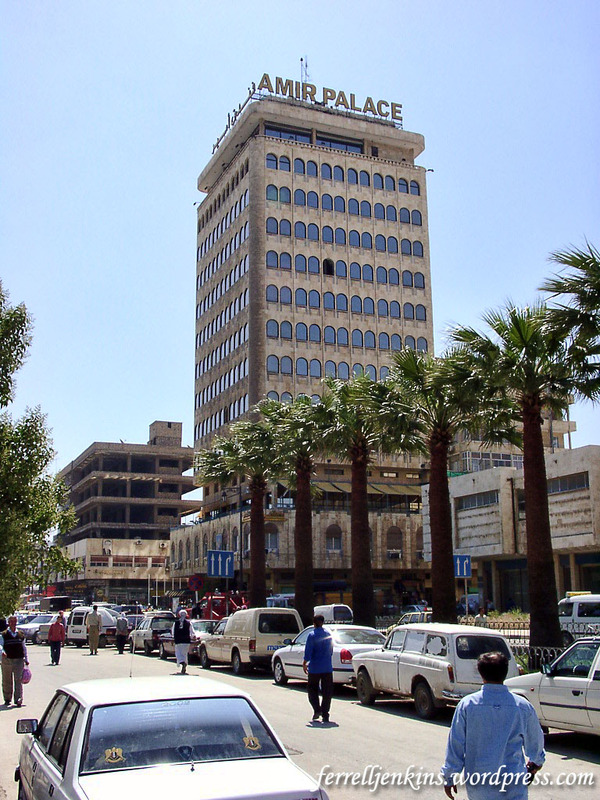 Amir Palace Hotel in Aleppo, Syria, May, 2002. Photo by Ferrell Jenkins. After dinner, David offered to buy me a candy bar at a little kiosk across from the hotel. We walked over in great anticipation, but soon learned that none of the candy bars were sweet. Spoiled Americans! This morning we went to the Aleppo National Museum which was directly across the street from the hotel. Spent about 1 ½ hours there. Even though photos are not permitted I was able to get several good ones. There are numerous items in the museum and adjoining yard from Tell Halaf, the ancient site of Gozan located northeast of Aleppo near the Turkish border. (Do not confuse Tell Halaf with Tel Halif in southern Israel.) Tell Halaf is identified with the city of Gozan to which Israelites were deported by the Assyrians (1 Chronicles 5:26). To enter the Aleppo National Museum one must walk past three basalt caryatids in the likeness of Hadad from Tell Halaf. The central one is standing on the back of a bull and the others are standing on the back of lions. Entrance to Aleppo National Museum in 2002. Photo by Ferrell Jenkins. 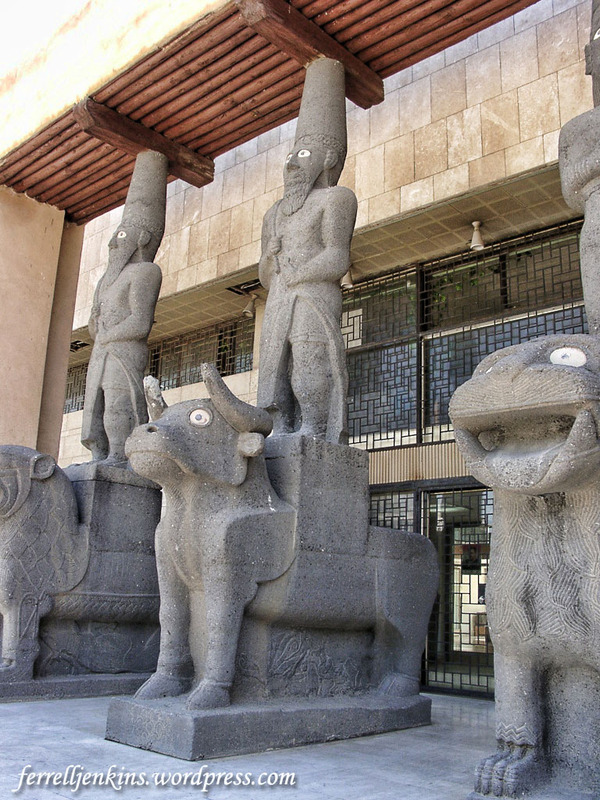 In the courtyard there were at least two images of Teshub, the neo-Hittite storm god from Tell Ahmar. 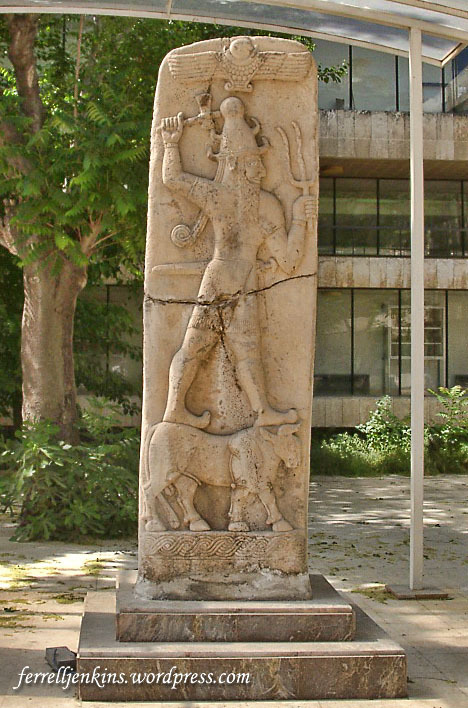 Teshub, the neo-Hittite storm god, standing on a bull. Photo by Ferrell Jenkins. I have several photos prepared for another post (or two?) to help you get some idea about the treasures in this museum. The greatest tragedy in the recent crisis in Aleppo is the inhumanity of man and the loss of life. But the destruction of many historical treasures in Syria is a loss for all of us. Recall the admonition of Peter when he cut off the ear of one of those who came to arrest Jesus in the Garden. This entry was posted in Archaeology, Bible Lands, Bible Places, Bible Study, Israel, Old Testament, Photography, Travel and tagged Aleppo, Syria. Bookmark the permalink.